Welcome to the New Yanoff HomePage! You will never read Usenet the same again! 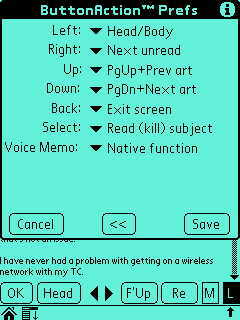 New Yanoff is SonLight Software's closed-source fork of the original Usenet (NNTP) newsreader client for Palm OS PDAs, GPL Yanoff. With New Yanoff, the premier portable newsreader™, you can read your favorite internet newsgroups ANY TIME, ANYWHERE. 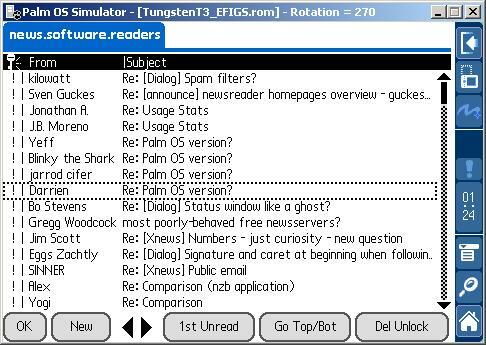 New Yanoff is the most customizable, mature, and fully-featured Palm OS newsreader available as well as a very capable, basic SMTP email client. It consists of two different programs: Yanoff+ or (free) Yanoff-. Yanoff+ is the advanced version of New Yanoff and is distributed and licensed as "Trialware". That means that you can download Yanoff+ and try it out free of charge for 15 days. After 15 days, the trial period will expire and the program will revert into the same feature set as (free) Yanoff-. When you purchase a Yanoff+ license, you will receive a key that unlocks Yanoff+ restoring the original features if it has expired (plus a few features that are ONLY available to registered users). The key does nothing for Yanoff- as it is a totally distinct executable which neither expires nor unlocks. See a short demonstration of Yanoff+ in action. Yanoff- is the scaled-down version of New Yanoff that is totally free for personal use. It is intended to be a useful substitute for Yanoff+ while serving as a constant demonstration and reminder as to why everyone should purchase a license for Yanoff+ (this is sometimes called "Demoware"). As you may already know, Yanoff has existed as free software under GPL since 1999. We support open-source software and, as part of our commitment to the pre-existing user community, we intend to provide this free version of New Yanoff alongside the fully-featured Trialware version. See a feature comparison of (Trialware) Yanoff+ vs. (free) Yanoff-. We have secured a license to the source code for GPL Yanoff as it existed in 2003. This branch has become New Yanoff. New Yanoff and the license which allowed its creation in no way changes the status of GPL Yanoff which hopefully will continue to be extended by the open-source community. In the same manner that GPL Yanoff is not entitled to any of the source code for New Yanoff, we are not entitled to any of the source code for any further changes to GPL Yanoff (unless the authors explicitly grant it); the two software streams are totally separate but will hopefully grow together in a compatible manner, each sharpening the other. To that end we have enjoyed (and intend to continue) providing several bug fixes to the GPL Yanoff sources. Read more about all this in the User Manual. How do I Purchase a License (Key) and Become a Registered User? A single-user, single-device license for Yanoff+ costs just US$24.00 and is distributed by email (or HotSync when purchased from within Yanoff+ on your PDA). Quantity discounts and site-licenses are also available; please visit the Order Page for complete details. All New Yanoff software, documentation, and utilities are available from the Download Page. To find out if an upgrade is free, see the our Upgrade Policy. When you purchase a Yanoff+ license, you also obtain 1 full year of free email support. Ad-hoc support for Yanoff- is available only as our schedule and workload permit. All users are encouraged to submit a bug report via email at any time. Go back to the SonLight Software HomePage.